(CNN) -- Whether you're into baseball or backgammon, Harry Potter or heavy metal, Ning has an online network for you. 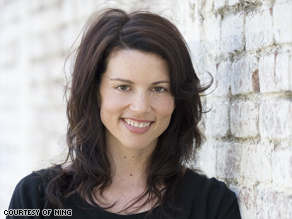 Gina Bianchini, CEO of Ning, says her site brings together people with common interest and passions. A fast-growing, free Web site launched two years ago, Ning lets members custom build their own social-networking platforms based around their passions and pastimes. As Facebook and MySpace connect people to friends and family, Ning gathers users around common interests. The site hosts networks for hip-hop music lovers, video gaming moms and teens obsessed with the Twilight book and movie franchise. Other popular Ning networks bring people together online for political and social causes such as "Pickens' Plan," which advocates wind energy. Ning had 4.7 million unique visitors as of January and surpassed 1 million social networks -- about one-fifth of them considered active -- last month. Ning also enhanced its site in March with new features such as a real-time activity feed so users can get up-to-the-minute reports -- not unlike Twitter's tweets -- about what others are doing. CNN: Where did this idea for Ning come from? Bianchini: We really started with a very simple premise. What if you gave people the opportunity to create their own social experiences for their own unique passions/topics/interest? We started on the ground floor to build it in such a way that it can be customized and programmed and made truly unique for each individual. I believe the most powerful ideas are the most simple. CNN: What is the mission of Ning? Bianchini: It's a way to get people to organize and get people to meet around their passions. CNN: Did any specific Web sites or companies inspire you to create Ning? Bianchini: We were really inspired by the first wave of Internet companies truly native to the Web like Craigslist and eBay. They were really around people connecting to other people. They were really about the Internet connecting people to each other. It's completely unique to the Internet -- you can't do it via television or newspapers. CNN: Did you expect the idea of connecting people though common interests to be so successful? Bianchini: Social behavior is really what people want to do online. It was clear for the rapid adoption of social networking in general that it is very much the case. CNN: What are some of the interesting social networks on Ning? Bianchini: There are 200,000 social networks are active right now, and they are across tens of thousands of unique passions. There is a network called 'This is 50.' It's like a hip hop TMZ. Another is the 'Pickens' Plan.' It's a way they are organizing more than 200,000 people around wind-energy policy. There is another one for cricket, specifically Indian cricket, which has added half a million people in the last two and a half weeks. There is another about the Twilight saga for teens. So it ranges from 50 Cent to teens talking about Twilight to serious adults looking at how to make changes in government policy. That's the power of the Internet and the power of connecting people. CNN: What do you attribute to the growth of Ning? Bianchini: What's fundamental in the adoption of Ning is that people are unique. They have unique interest and passion and they like having a contact for that experience and for their identity. CNN: What makes Ning different from other social-networking sites? Bianchini: It's focused on providing the [means for] people to create new social networks around their interests and passions and connect new people around those passions. We think that's a very critical element of organization. The Facebook phenomenon connects you to people you already know and Twitter is amazing for news and real-time events. What we see with people who gravitate to Ning is meeting new people with similar interests. CNN: How can Ning be useful to organizations or corporations? Bianchini: When you can bring people together around a common cause there is incredible potential to do fundraising and to organize volunteers. CNN: How does your site make money? Bianchini: If you want to add a feature like making your own domain, you can pay a la carte for options. On the free service there are ads contextual to what the network is. CNN: What are your thoughts on the future of social networking? CNN: What are some of your company's goals in the future? Bianchini: We are really focused on making our service perfect for people who come to meet new people. We're growing really rapidly and we're seeing a lot of interest and new people joining social networks. All About Internet • Facebook Inc. • MySpace Inc.